The HX6001F is a complete constant current/constant voltage linear charger for single cell lithium-ion batteries. Its package and low external component count make the HX6001F ideally suited for portable applications. Furthermore, the HX6001F is specifically designed to work within USB power specifications. No external sense resistor is needed, and no blocking diode is required due to the internal MOSFET architecture. The charge voltage is fixed at 4.2V, and the charge current can be programmed externally with a single resistor. 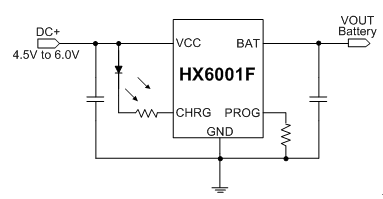 The HX6001F automatically terminates the charge cycle when the charge current drops to 1/10th the programmed value after the final float voltage is reached. The HX6001F converters are available in the industry standard SOT-23-5L power packages (or upon request).